In a medium bowl, toss the chicken breast, corn, black beans, green onions, tomatoes, cilantro, and corn chips together. Add the vinegar and mayonnaise to mixture and toss to coat. Salt to taste. 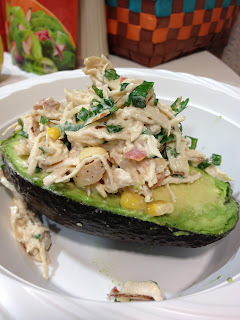 Spoon salad into halved avocados. Serve immediately with a spoon and fork. We doubled this recipe to have some leftovers. 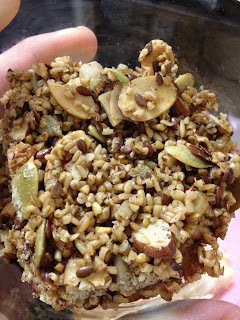 I made some delicious granola bars today, but let's talk about that last so we end on a happy note. Crock Pot Day 8 of 365...the end. I did make a recipe today. I made bread in the crock pot. It was an epic fail. Today was day 2 of meetings that are being held at our church that consists of about 10 pastors meeting and fellow-shipping in God's Word. I volunteered to provide salad and bread. I have had a recipe for crock pot bread pinned on my pinterest for a while and thought...I need bread and I'm doing a crock pot a day recipe...perfect! I really think it would have turned out if I would have stuck to 1 one pound loaf, but I got all brave and did 2 one pound loaves in my larger crock pot. Needless to say it never finished cooking in the crock pot. It may have by tomorrow morning. However, my mom ended up taking it home from the pastor's luncheon and throwing it in the oven. I hope it tasted good and was not a waste at least. My husband ended up having to drive through Panera and getting baguettes. Oh well. On the other hand the failure of the bread brought on a bad discussion of crock pot recipes and doing one 365 days in a row. The hubs does not like the idea and I have to support that. So while it is not the absolute end to crock pot recipes, there just won't be a lot of them. Sorry. On the other hand, I'll have a happy husband and that's more important to me. Yeah...I know...cry it out. :) You can still check out the bread crock pot recipe here. Back to the delicious granola bars! Even though I'm not technically going on a diet until after the baby is born, I do want to start eating healthier than I have been. I found this recipe and made it this morning and it is definitely a keeper. I love that you can make it into a cereal just by putting in regular oats instead of steel cut oats. I hope you enjoy it just as much as I am! 1. Preheat the oven to 250 degrees. Cover a rectangular baking sheet with parchment paper. 2. 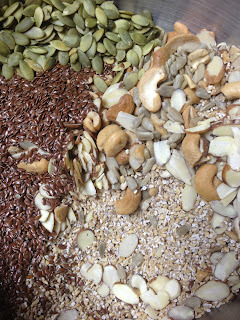 Mix the dry oats, almonds, cashews, coconut (flax seeds in my case), seeds and spices together in a large mixing bowl. 3. Heat the butter and honey together in a small saucepan over low heat. Once the butter melts stir in the vanilla. 4. Pour the hot liquids over the dry ingredients and stir together with a rubber spatula until evenly coated. 5. 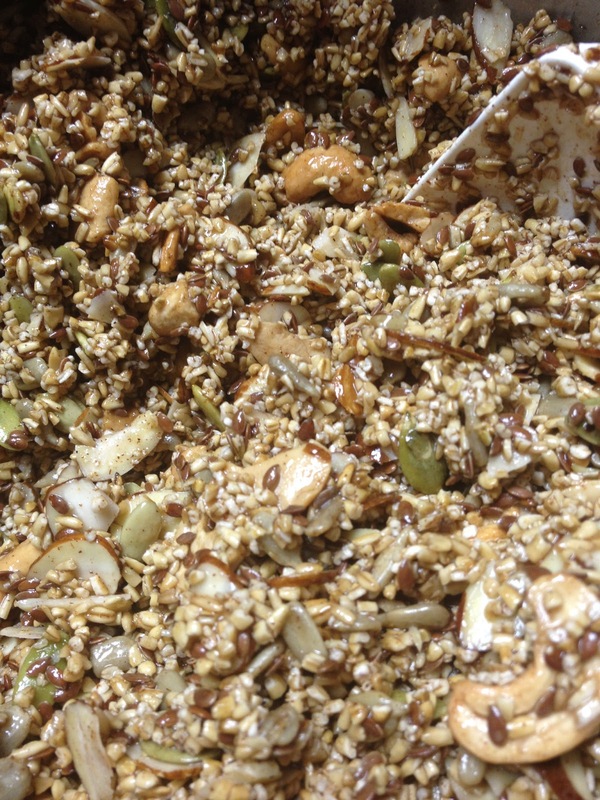 Spread mixture onto prepared pan in one even layer. Bake for 75 minutes. 6. The granola will become crisp as it cools at which point you can break into pieces (if making bars) or break it up into small chunks by pounding it in a zip lock bag (if making cereal). Store in air tight container at room temperature for up to 2 weeks. YAY! A whole week! I blogged for a week straight! lol It's the little things in life! I had the day off of work and it was a cold day. Our basement does not get much heat at all. However, it made me search for today's crock pot recipe which was super delish! I hope you like it as much as I did! 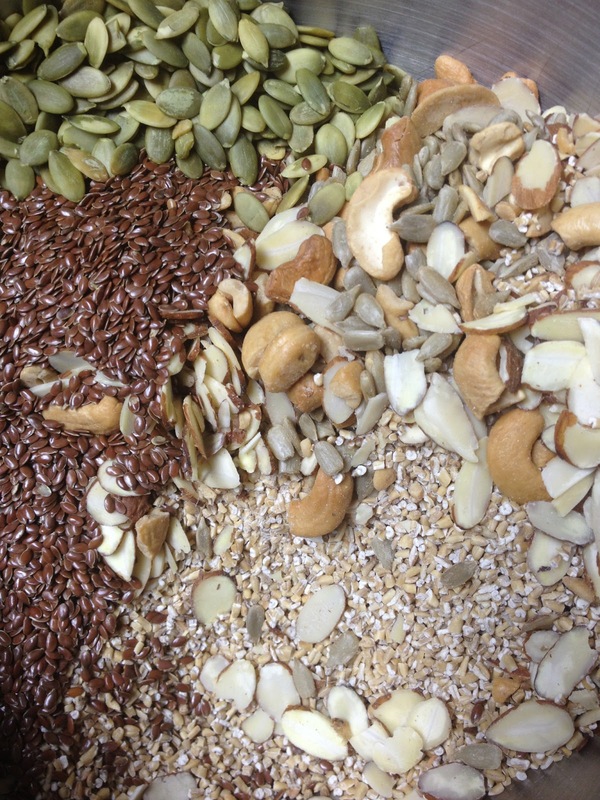 This will make enough for 2 people to have a big mug with a bit leftover. If you are having friends over, adjust the recipe accordingly. Or, you can do like I did and half it to make a nice mugful for yourself. Mine fit right inside of my travel mug! Add the coffee/espresso and milk to the crock pot. Whisk in the pumpkin, spices, sugar, and vanilla. Cover and cook on high for 2 hours if everything is cold. Whisk again. Ladle into mugs, and garnish with whipped cream and additional cinnamon. The hubs is going to start eating healthier and working out, which means my goal for 2013 is to help him meet those goals. I want to help him be healthier and be a totally different person by 2014. So from now on you will be seeing a lot more healthy posts...yay! Besides the fact, I'm going to have to join the battle of the bulge after the baby is born. I already have plans to join a local weight loss group that begins April 6th. So enjoy this last rich meal! Now you are on a diet too...bwahahaha! 1. Cook sausage in a skillet over medium heat until no longer pink. 3. In the same skillet, melt butter. 4. Stir in flour and pepper until smooth. GRADUALLY whisk in milk and soup. 5. Bring to a boil; cook and stir for 2 more minutes or until thick and bubbly. 7. Transfer to the crock pot. 8. Cover. Cook on Low for 7-8 hours. Stir! No big plans were made for today, but I knew I did not want to spend a lot of time fixing breakfast. So I threw this together the night before and set it to cook. I probably wouldn't fix it again for myself (I don't care for sausage), but the hubs liked it. Maybe next attempt will have bacon instead of sausage...what is your preference? 1. Cook meat, drain & crumble. Set aside. Save a bit of the oil & add onion & peppers. Cook until onions are soft. 2. Spray 6 qt. slow cooker with non-stick spray or use liner for slow cooker. 3. Put in half the potatoes, meat and vegetables in the slow cooker. Sprinkle with half the cheese. Repeat. 4. Mix together eggs, milk, sour cream and seasonings. 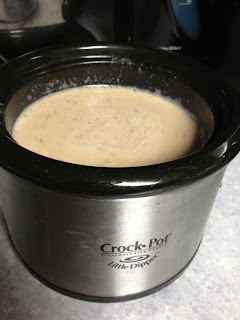 Pour mixture over the top of ingredients in crock pot. 5. Cook on low for eight hours.